We help you to get closer to your goal of a data-driven company! 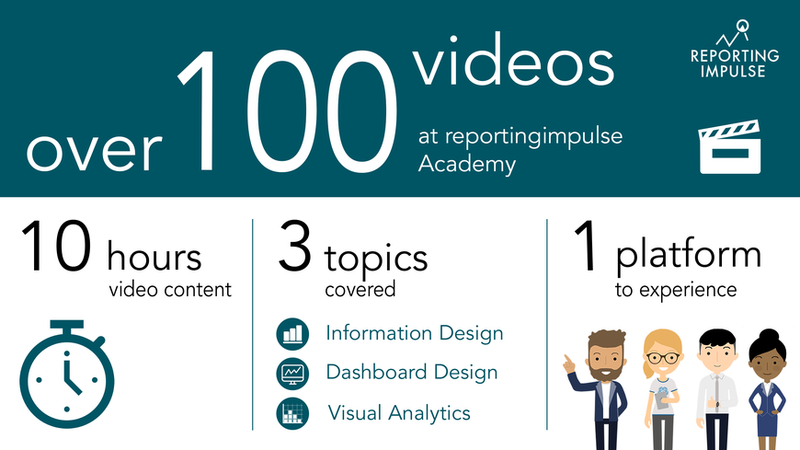 Effective immediately, you can be trained anywhere and anytime in the disciplines of Information Design, Visual Business Intelligence and Visual Analytics - simply on our reportingimpulse Academy learning platform! We will show you how to standardize your dashboards and reports in such a way that they deliver exactly the information that is necessary for faster and better decisions. The methods and trainings of reportingimpulse have been developed and tested over several years with renowned customers from various industries. 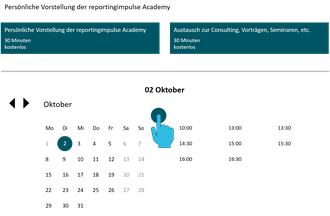 Here you can have a look at the publicly viewable part of the reportingimpulse Academy learning platform. What else is in for you? The training for the recommended 30 days! In the first 10 days the topic is Information Design and its recommendations for a standardized presentation of static information. For this information to be communicated in a comprehensible manner, an appropriate design and a suitable chart have to be chosen for the intended statements. In addition, the reader comprehension can be improved by further methods presented in this course. For the next 10 days the subject is Visual Business Intelligence, or to be used as a synonym Dashboard Design. This represents the second part of the Visual Business Analytics triad. A large part of the rules defined in Information Design for the preparation of information also finds its application here. In dashboarding, however, the focus is on the interactive presentation of contents. The user himself is able to navigate through the data from different perspectives. In this course we will provide recommendations for well-designed and interactive dashboards. Therefore we show building instructions, so-called Storytelling Frameworks, for the development of common dashboards. In the last 10 days the topic Visual Analytics, the last part of Visual Business Analytics, is in focus. This one distinguishes itself clearly from the previous ones and many of the established rules no longer apply to this type of dashboard. They are not primarily a means of conveying information, but rather an interactive analysis of large data volumes performed by experts from the respective subject areas of the dashboard. The common basis of all parts of Visual Business Analytics is visualization. The forms of visualization are becoming increasingly complex in order to meet the requirements. You want to experience the advantages of Visual Data Analytics for yourself and get trained for it! You and your team want to reach the goal of a data-driven company! Simply fill out our contact form and we will get back to you! 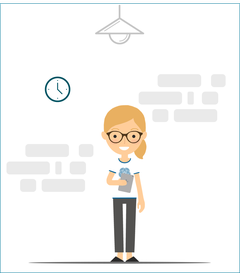 Alternatively, you can search directly for a suitable date for a personal exchange! Can I start immediately with the online training? Yes, the learning plan and all contents are available for you on the reportingimpulse Academy learning platform. We also offer feedback on your solutions from the experts at reportingimpulse. In which tools are the solutions for the practical tasks available? Currently we show the solutions in PowerBI, Tableau and parts in Excel. In the next months we also plan to provide solutions in Qlik Sense and board. All solutions will be presented and described in a video. My tool isn't available, is the training still something for me? Yes, the presented methods, frameworks and recommendations are tool-agnostic. The implementation is possible in all modern BI tools. Due to the methods used, the solutions are always very similar despite different tools. Is the a solution for each practical task? Yes, in PowerBI, Tableau and partly also in Excel. In addition to these sample solutions, you can also upload your own solution for selected tasks on the platform and receive personal feedback from reportingimpulse. What are practical/ leading tasks? Each course consists of four parts, each of which is didactically oriented towards a specific task. 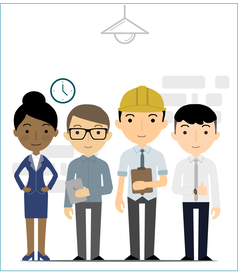 These are typical practical tasks, which are based on our project experience. With the impulses of the chapters the leading tasks can be solved. I don't have a BI tool in use yet - what should I do? The content provides you with solid know-how in order to take your reporting to the next level. We can also organize a test license of a common BI tool for you, so that you can gain your first BI experience. You will also gain practical insights into many implementations of different tools. Is there a possibility to have mobile access to the platform? Yes, you can download an app and also consume content offline. Nevertheless, we recommend solving the guiding tasks on your laptop. However, you are welcome to download the content impulses and have a look at it mobile in advance. 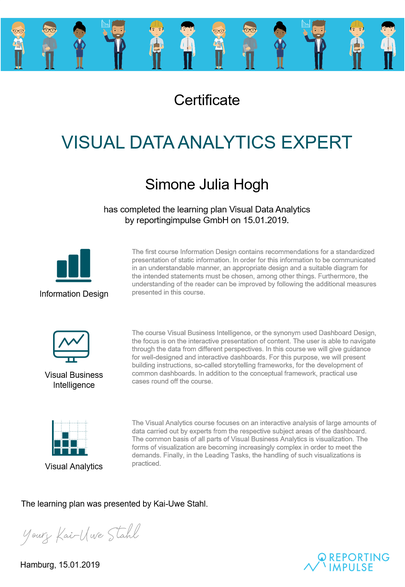 Yes, just like our on-site seminar participants, we award the Visual Data Analytics Expert certification. How can I book the training? The easiest way is via our online shop, if you have single licenses. After the purchase you will receive the login data for the platform and we will send you an invoice. Alternatively you can send us an email to anmeldung@reportingimpulse.com to book the training. If you would like to purchase multiple licenses for your team or company please feel free to contact us personally. 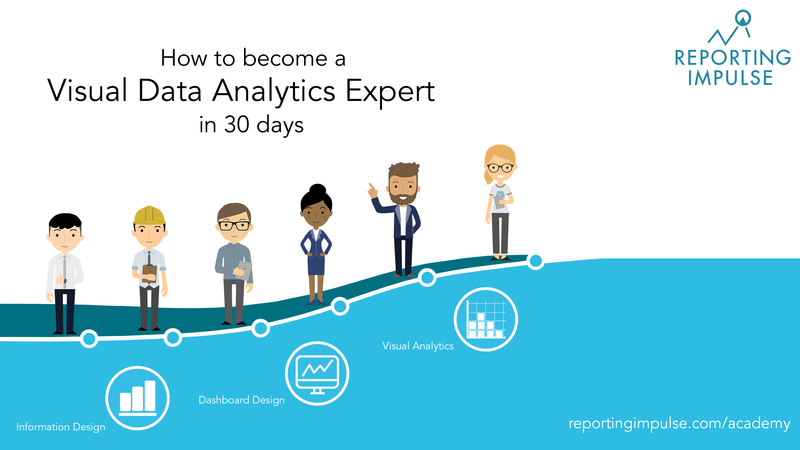 How long does the training with the Visual Data Analytics Expert certification take? We recommend that you complete the training in 30 days. If this is not possible due to your day-to-day business, this is not a problem. In any case, you have one year access to all content. We offer a webinar every two weeks, in which we answer all the questions you ask us during the webinar and also discuss the questions we have received in the last weeks. Who should register for the training? For whom is it suitable? For all those who want to get more out of their data and want to act more data-driven. How long do I have access to the content on the platform? You have 365 days, i.e. one year, access to all contents of the platform. Of course, you also have access to all new content that we add during the year. An extension is possible on request. Does gaining access to the platform make sense if I have already participated in an RI training? Yes, the one-day trainings by reportingimpulse are always very compressed and all contents of the platform cannot be conveyed. In addition, the focus in online training is much more on experiencing the new impulses yourself in the form of leading tasks. In addition, you can view all content again at any time or search for and repeat specific topics. Is it a classic BI tool training? No, we developed the training to digitally provide our proven tool-independent methods, frameworks and recommendations from our variety of projects and training sessions. We want to empower you to run successful Visual Data Analytics initiatives on your own and to design your business in a data-driven way. There are only mini tools tutorials, i.e. short hints for the implementation in the mentioned tools. We recommend a basic tool know-how. In which languages is the platform and its contents available? We offer all contents of the platform in German and English. I couldn't find an answer for my question! What should I do? You are welcome to contact us via the contact form or via email (info@reportingimpulse.com) with your question. Alternatively you can also search directly for an appointment for a conference call here.